Approximately 9–11 mm long. These bees can be easily spotted because of their bright metallic green or blue colouration. Females are bright green all over, whereas males have a bright coloured head and thorax with a yellow-and-black striped abdomen. Females have hair-like structures, called scopae, to transport pollen on their back legs. Similar Species: Genus Augochlora and Osmia may be confused for the Agapostemon genus because all have metallic species within the genus. However the rear edge of the thorax is flat and curved with a ridge on Agapostemon, while Augochlora is rounded and ridgeless. Osmia is broader all over and carries pollen beneath the abdomen instead of the legs. Range: Found across southern Canada. Habitat: Green sweat bees can occur where there is a supply of nectar- and pollen-rich blooms and suitable nesting habitat. This is a ground-nesting bee that nests in bare soil where the ground is either flat or sloping. Diet: These bees gather pollen and nectar for themselves and their developing young from many different flowers, which their short tongues can easily access. These are solitary bees, meaning they nest alone. They dig burrows deep in the ground to lay their eggs. Sometimes these nests are communal, where a burrow entrance is shared by group of females. Each female branches out from the entrance to create her own tunnel where she nests alone and takes care of her own young. The responsibility of guarding the main entrance is shared among the group. The two main threats to most pollinators are habitat loss and pesticide use. 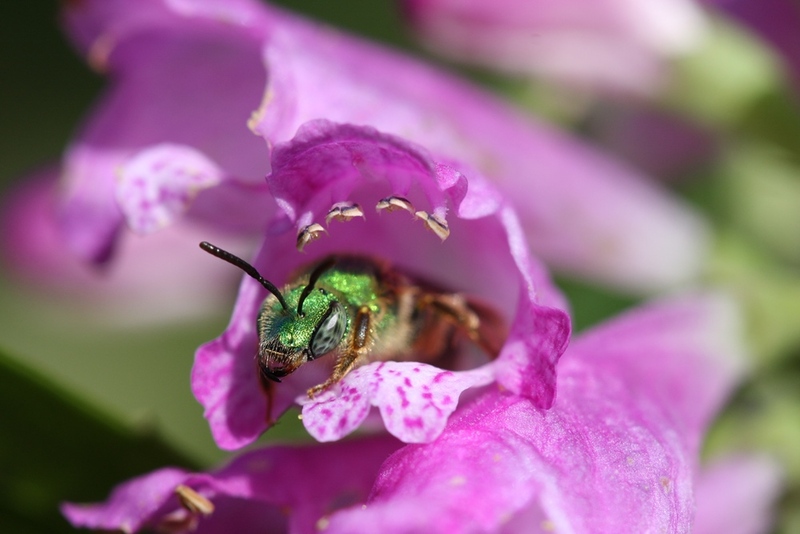 Although this species is not currently at risk, you can plant native plants such as wild roses sunflowers and asters in your garden to help support green sweat bees and other pollinators. How to know the Insects. Third Edition. Bland, Roger G.; Jaques, H.E., 1978. WCB/McGraw-Hill. United Sattes of America. Insects: Their Natural History and Diversity. Marshall, Stephen A., 2006. Firefly Books Ltd. Richmond Hill, Ontario. Pollination is one of the most important ecological processes on the planet. But our pollinators are in trouble due to a loss of habitat, toxic chemicals, parasites, diseases and climate change. Using the Wild About Pollinators poster, explore the pollinators and some plant species found in Canada.